The Washington Capitals have one of the best offenses in the league along with a strong power play, but are on outside looking in at the playoff picture and are unlikely to reach the postseason due to a grueling schedule down the stretch. Their defensive play has been their focal problem for the past few years and will continue to be until the issue is addressed and a top four defenseman is added that can play effectively in their own end and contribute offensively. General Manager George McPhee has built a blue line with some good young pieces and continued that this week, signing Russian defenseman Dmitry Orlov to a two year contract extension. Orlov, Alzner and Carlson highlight Capitals defensemen that must be part of the future. Past that is unclear. Connor Carrick is another young blue liner that is playing in his rookie year. Carrick is another talented offensive player, but his defensive game, like many rookies is unrefined. Mike Green is not what he once was several years ago and is a liability in his own end. The 2014-15 contracts of John Erskine and Jack Hillen are roadblocks in adding another defenseman in free agency, but there aren’t many options out there to begin with this coming summer. Finding a top four defenseman is a necessity and the best way is through the draft. The Capitals could have that in soon to be 19 year old defenseman Madison Bowey. The Capitals selected Bowey in the second round of the 2013 NHL entry draft after their first round selection of Andre Burakovsky in the first round. Bowey, 18, plays for the Kelowna Rockets of the WHL and set a team record Friday night with his 20th goal from the blue line, the most for a Rockets defenseman in club history. Bowey has 20 goals and 39 assists on the season, including six power play goals, easily eclipsing his 30 point total in 59 games last season. Born in Winnipeg, the thoughts of getting selected by his hometown team crossed Bowey’s mind for sure. The 6’3”, 203 pound defenseman brings a compelling offensive game that Washington desires in many of their defensemen, but he wants to become a two-way blue liner for the Capitals, something they desperately need. 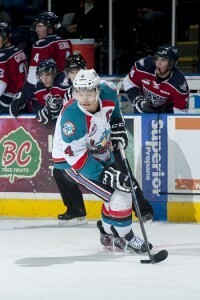 Playing in his third full season for the Rockets, Kelowna recorded the top record in the Western Hockey League (WHL) and that was a goal Bowey and the team set out prior to the season. Kelowna will face the Tri-City Americans in the first round of the WHL playoffs beginning March 22nd. Bowey was named Captain of the Rockets prior to the opening night faceoff, giving him a leadership role that he is already accustomed to. He was an assistant Captain for Canada’s Under 18 team that won the World Junior Hockey Championship during the 2013-13 season. He paid attention to Canada’s performance in the Under 20 WJHC this winter and knows from experience that developing chemistry in practice and during the beginning of the tournament is huge. One of his goals is to make the Canada’s Under 20 roster if he can’t break in with Washington. “The big key is coming together right away off the bat. I know at the U 18 Tournament our team we bonded right away. Our coach made sure that we came together as a team quickly and that’s what we did and it showed on the ice. In a tournament where you can’t really take any days off, we didn’t there and it showed in the result of winning the Gold (medal). His main goal is to impress the Capitals like fellow young defenseman Connor Carrick did in Washington. A summer of training after a hopeful championship run for the Rockets in the WHL will preclude that dream. Bowey said that his agent and the Capitals have discussed when the young defenseman could make the jump to the pros and earn his entry level deal. He’s focused on his Junior team before any thoughts of what he’ll do next year however. If signed to an NHL deal after his junior season ends, Bowey could join Washington’s AHL affiliate, the Hershey Bears, on an ATO.